We are a small busy health education charity delivering services internationally in Africa seeking a Community & Events Fundraiser (Volunteer) based in Altrincham near Manchester. This is an exciting role and we are looking for a candidate with a real can-do attitude with the energy, drive and enthusiasm to be the face of the charity in the local community. You should be able to build and develop relationships in the community and provide support to existing partner schools, groups and local businesses. In order to apply for this position, you should have the following skills and experience: Good communication and presentation skills; excellent interpersonal skills; the ability to liaise effectively and establish good working relationships and be computer literate. Ideally it would be great if you have some community fundraising experience and ability to build strong relationships, however most important of all we are looking for people with the transferable skills needed to help us to generate funds through our local community. If you feel you have these attributes, we would be delighted to hear from you, please send me your up to date CV. Please note that only suitable candidates will be contacted with further information. A driving license with use of vehicle would also be helpful. Duration: We are looking for volunteers for periods of 3 months or more over the next 12 months. To provide administrative, research and creative support for the marketing and fundraising function. The intern will help engage with supporters and potential donors to raise awareness of Act4Africa and maximise the fundraising income from individual donors, ad hoc events and products/trips. 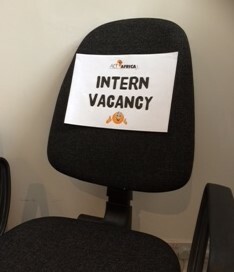 The intern will ideally be skilled at using various social media to engage with supporters; they will produce content for the Act4Africa website and assist in the production of marketing communications, including emails, newsletters and press releases. The intern will help to maintain and develop the charity’s profile and reputation and provide excellent customer service to supporters, donors, event participants and prospective participants. To meet this challenge, you should be a proven self-starter; able to work on your own initiative and be an excellent communicator both written and oral. You will need to be organised with good administration skills. Ideally you will have experience of marketing and/or charity fundraising and have an interest in the work that Act4Africa do. A degree awarded from a UK university is preferable. Please download and complete this questionnaire and supply a CV and covering letter demonstrating how your skills and experience match the requirements of the internship. We are a tiny organisation based in Altrincham, Cheshire and strive to keep our overheads here to the minimum to allow us to maximise our overseas development activities. Unfortunately, as a non-profit organisation we do not provide a wage for interns. However, we do cover local travel expenses. Our USP is that you will be able to experience how an international NGO works at home and abroad. As we are a small team based in the UK office, you will gain a good insight into our project implementation with our African partners as well as hands-on experience of marketing and fundraising. Read more about our Internship Programme here. Tom went on to join another charity as a permanent employee in their marketing department.